Pizza is so savory and easy to make. If you have never attempted to make it from scratch don't be intimidated. I hadn't before either and look how mine turned out! 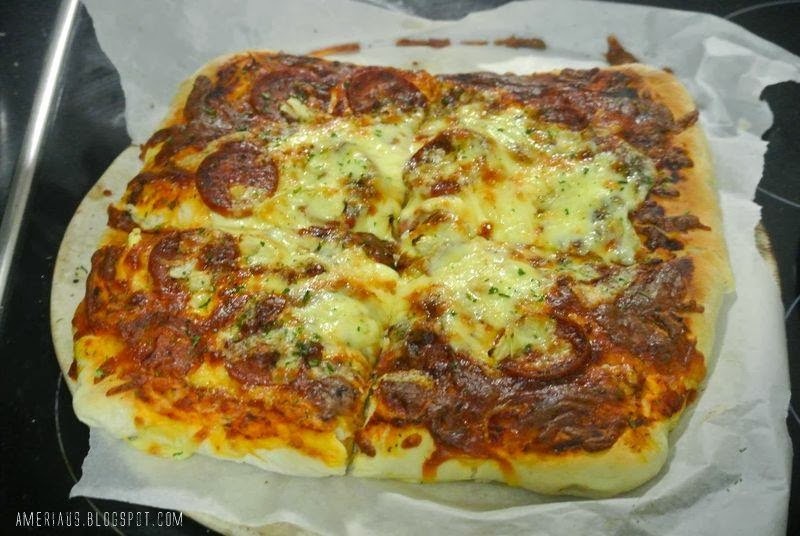 Its simpler than it seems and once you try it you can say goodbye to major pizza chain and hello to homemade-pizza-goodness!!! In a small bowl combine your yeast, water, and sugar. Cover this mixture and allow to sit in a warm place. Place your flour & salt in another bowl. Once your yeast begins to bubble add it to the flour-salt mixture and mix well. Use your hands to help the dough take form. Spray the dough with a bit of canola spray on all sides and then toss in a bit of flour. Place in a bowl & cover for 25 minutes to allow it to grow in size. Using a rolling pin and your hands shape your pizza base. In a bowl mix tomato sauce and ricotta. Spread a thin layer on your base. Season with S&P and oregano. Sprinkle with mozzarella cheese and add your salami. Cook until base is crispy and cheese has melted.